Downloading homeschool ebooks can save you money on curriculum and reading material. Some are even free. E-mail and social media is a great way to find free resources. I subscribe to blogs and homeschool curriculum companies. I also watch for free deals on twitter and facebook. One of my favorite sites is Homeschool Freebie of the Day. I have received their e-mails for years. There are also sites where you can download books in the public domain. If you use a lot of classics in your homeschool you can download most of them for free. One of my favorite sites is Project Gutenberg. My public library also has downloadable books that can be borrowed. A favorite site to download free and inexpensive curriculum is CurrClick. I have also downloaded free books for my Kindle. Amazon sends me e-mails of deals. You can also find free EBooks on social media. Many of my friends that have blogs post free resources on facebook and twitter. Besides being free, most homeschool EBooks are available for considerably less than what a printed book would cost. Some are even free. You can print only the pages of the book that you need. This saves on ink and paper costs. You do not need to buy multiple copies of each book. But remember that most EBooks have a copyright for personal or family use only. You should not share the book with other people. You can download from the internet so you do not have to pay handling and shipping charges. Also the download is immediate you do not have to wait for the mail. Even if you don't have internet you can download at your library and other places that have free Wi-Fi. Because e-books are usually stored on your computer or e-reader you will not need to buy bookcases. There are several ways that you can read homeschool e-books. Before e-readers and smart phones most people downloaded PDF files onto their computer. All you needed was the free Adobe reader. Today you can buy e-readers such as the Nook or Kindle. You can buy e-readers online. Some are available at your favorite department store. The Kindle Fire will read PDFs. By the way Amazon has an app for the Kindle Fire HD and Kindle Fire 2nd Generation called FreeTime. It allows parents to customize the Kindle for their children. You will be able to customize how long your child can play games or watch videos. There is no charge for using the app. You can also subscribe to FreeTime Unlimited. With the subscription your child can choose from thousands of books, games, videos, and apps for children 3 through 8 years of age. Another thing that I like about the Kindle Fire is that it can play audio books. This would be good for people who struggle with reading. 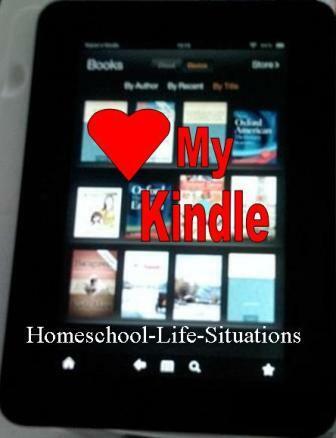 Learn more about homeschool EBooks and the Kindle at Amazon.